393 pages | 89 B/W Illus. We hear a lot about how agriculture affects climate change and other environmental issues, but we hear little about how these issues affect agriculture. When we look at both sides of the issues, we can develop better solutions for sustainable agriculture without adversely affecting the environment. Agroecology, Ecosystems, and Sustainability explores a modern vision of ecology and agricultural systems, so that crop production can be sustainably developed without further environmental degradation. 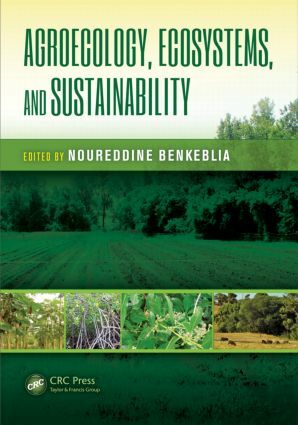 With contributions from experts from more than 20 countries, the book describes how to make the transition to modern agroecology to help the environment. It examines the global availability of natural resources and how agroecology could allow the world population to reach the goal of global sustainable ecological, agricultural, and food production systems. The book discusses important principles that regulate agroecological systems, including crop production, soil management, and environment preservation. Making the link between theory and practices, the book includes examples of agroecology such as an interdisciplinary framework for the management of integrated production and conservation landscapes and the use of mechanized rain-fed farming and its ecological impact on drylands. An examination of how ecology and agriculture can be allied to ensure food production and security without threatening our environment, the text shows you how natural resources can be used in a manner to create a "symbiosis" to preserve ecological systems and develop agriculture. "The contributors to this book consider new technologies and strategies for improving the agricultural system and crop production while protecting what is left of the resources we have. In addition to exploring these new strategies, the authors consider the transition period and the potential for agroecology. … The contributing researchers, scientists, and practitioners come from all over the world and represent a diverse collection of view points." Dr. Noureddine Benkeblia is a Professor of Crop Science involved in food science focusing on food-plants biochemistry and physiology. His work is mainly devoted to the pre- and postharvest metabolism in crops. Few years ago, he introduced the new concept of systems biology -Metabolomics- to investigate the mechanisms of biosynthesis and accumulation of fructans in Liliaceous plants. Prof. Benkeblia, first received his BSc, MPhil and Doctor in Food Sciences from the Institut National Agronomique (Algeria), and Doctor in Agriculture (PhD) from Kagoshima University (Japan). After few years teaching in Algeria, He joined INRA, Avignon (France) as Postdoctoral Scientist from 2000. From 2002 to 2007, he worked as a Visiting Professor at the University of Rakuno Gakuen, Ebetsu (Japan), and Research Associate at Hokaido University. Prof. Benkeblia joined the Department of Life Sciences, the University of the West Indies (Jamaica) in 2008, continuing his work on the physiology, the biochemistry and metabolomics of fructan-containing plants in Jamaica. He also works on the postharvest physiology and biochemistry of local fruits. Prof. N. Benkeblia published over 150 papers, over 37 books and book chapters, and was recipient of many awards among them the UWI-Award of the "Most Outstanding Research" in 2011 and 2013.